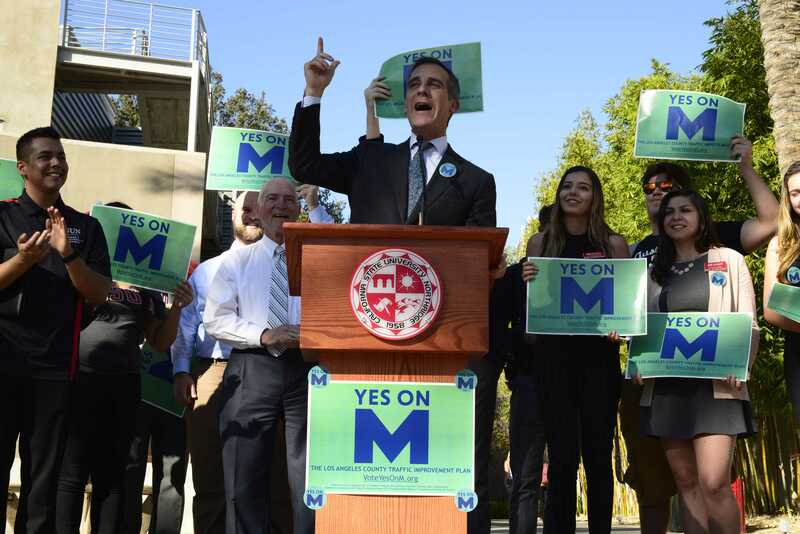 Los Angeles voters will have to make an important decision on Tuesday when voting for Measure M, which if passed, will increase sales tax by one half cent to fund major expansions to the L.A. transit system. Mayor Eric Garcetti, who is in full support of the measure, visited CSUN Thursday in front of a crowd of roughly 50 people to encourage students and community members to vote yes on M.
With almost all of the Associated Students standing behind him, holding signs saying “Yes on Measure M,” Garcetti spoke about improving transit lines, bike lanes, and bus routes. While the measure will certainly provide more transportation options, critics have been quick to point out that it will also raise taxes for all L.A. residents, for a long time. Ballet proponents themselves have stated that traffic congestion will improve 15 percent, but not until 2057, according to a Los Angeles Time article. Garcetti also mentioned in his speech that the entire project will cost $120 billion, but will create over 465 thousand jobs, mostly in the manufacturing sector. 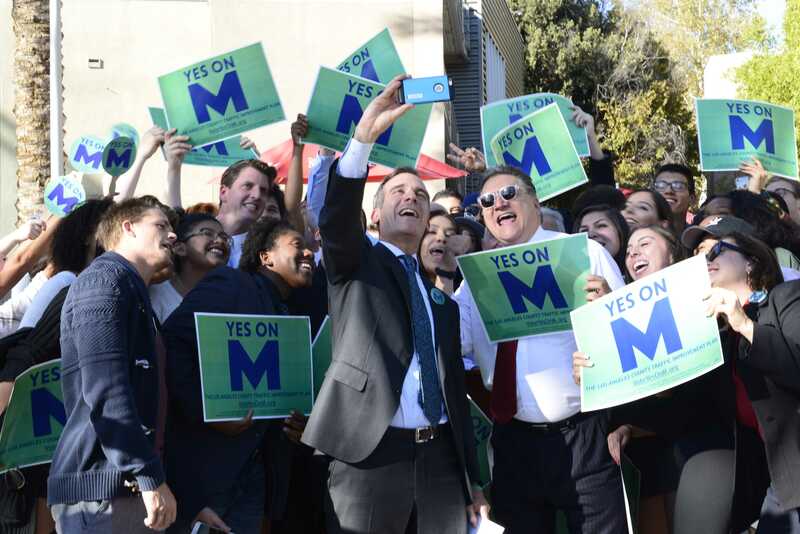 After the speech, students shared their thoughts about Measure M, some were in favor of it, while others weren’t entirely convinced. Samuel Azmon, a mechanical engineering major who currently uses public transit, was not happy about the prospects of a tax increase. Christopher Lee, a kinesiology major, had less of a problem with the added tax. While most would agree that better public transit would be a good thing, critics of the measure have voiced concerns about the timeline of the project and want to know when the people of L.A. will actually see the improvements the measure purposes, according to an NBC4 news cast. Long term projects like this sometimes include what is called a sunset clause which states that if a project hasn’t reached certain targets by a certain time, that the measure can be dissolved. When asked why Measure M was purposed without a sunset clause, and if he was confident that the project would be completed in a timely manner, Garcetti said that the timeline provided by Measure M was actually the slowest possible timeline and he believed certain rail lines could be completed in half the time. I voted “no” on M. It will only benefit a handful of downtown and Hollywood interests and construction union workers and cost the rest of us a half cent more for every dollar we spend. A fairer tax would have been a gasoline tax and a better program would have scaled down this ambitious construction project to one that could be completed by 2025.